Kreg KHC6 - Automaxx Face Clamp 6"
The perfect clamp for Kreg Joinery™. 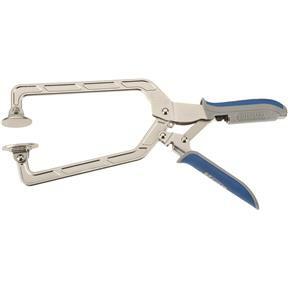 This face clamp features an extra large pad on one arm which is placed on the "show side" of the joint to help create a perfectly flush joint as the screws are driven. As a bonus feature, the clamp is also compatible with the Kreg Jig Jr's Portable Clamp Adapter so the Jig can be connected directly to the clamp for high-speed panel drilling. Each Face Clamp™ also comes with ergonomic comfort grips for reduced slippage and to eliminate the possibility of pinching. This Face Clamp features a 6" reach and will handle workpieces up to 5" thick.